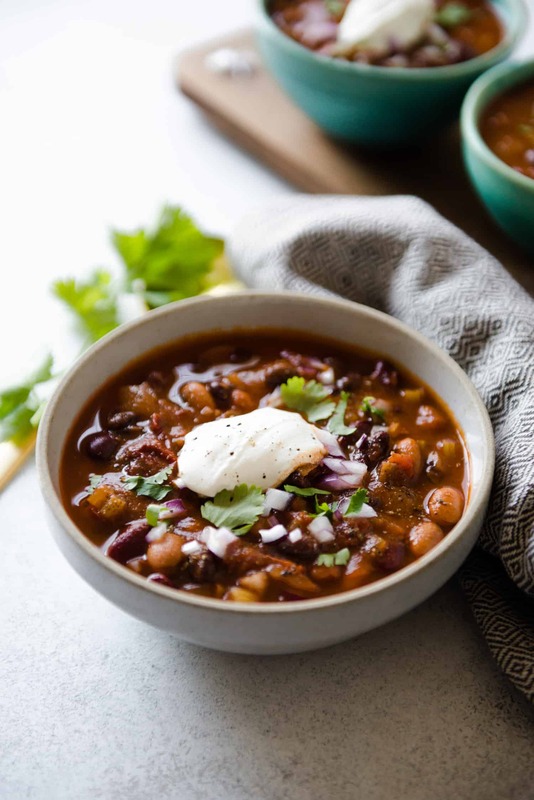 This hearty vegetarian three bean chili is packed with protein from three varieties of beans: pinto, black, and kidney beans. Chipotle peppers give spice and smoky flavor to the chili. Serve it with rice to make it a more filling meal! Thank you to USA Pulses and Pulses Canada for sponsoring this post! Although I’m not vegetarian, I tend to cook vegetarian meals most weeknights. It’s simply less fussy to prepare in general. I don’t have to worry about handling raw meat or checking to see if my piece of chicken is fully cooked. 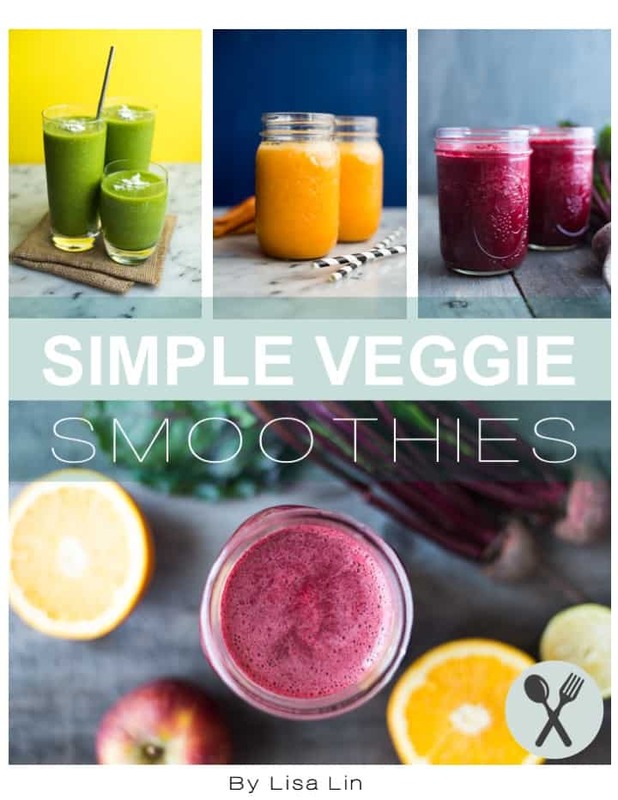 Plus, my vegetarian meals tend to be lighter and more fresh, which is my preferred style of cooking. Believe it or not, even my meat-loving husband embraces vegetarian meals! Pulses are a primary staple around our house. It is so easy to throw a can of beans into my meals to give it an extra boost of plant-based protein and fiber. 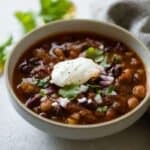 I usually have about 6 cans of beans tucked away in my pantry for quick dinners, such as grain and bean salads or soups. 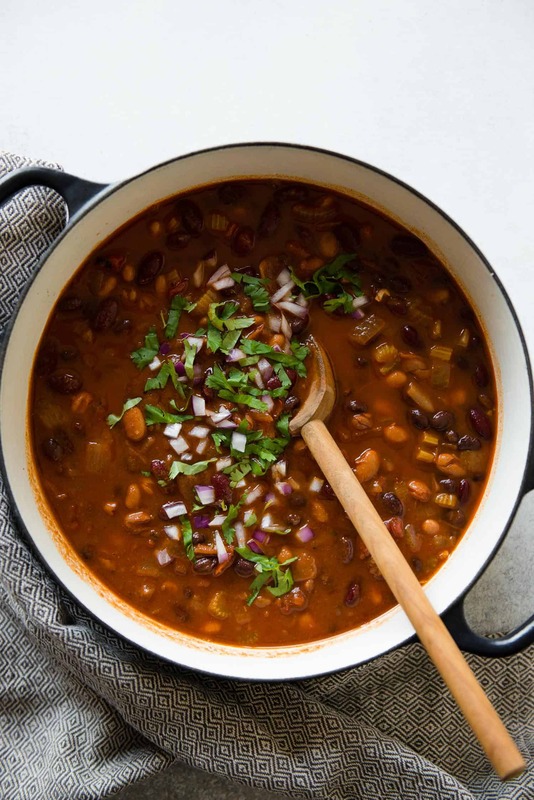 This chipotle vegetarian three bean chili is a one-pot wonder. The preparation is simple: sauté a few aromatic vegetables, throw all the ingredients into the pot, boil and then simmer. That’s all! 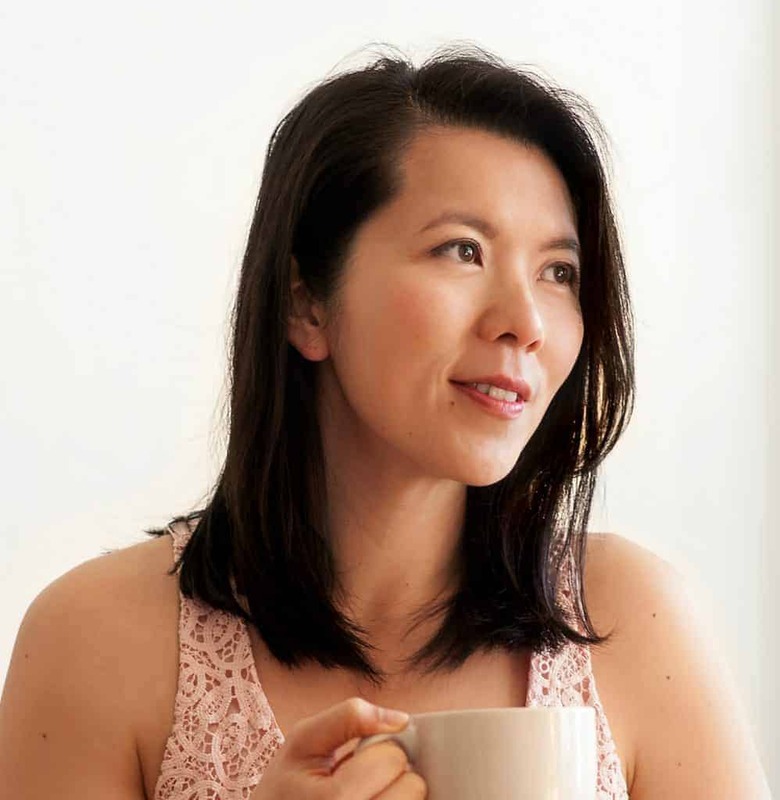 It is a low-maintenance dish that you’ll want to make on weeknights. Serve with rice: To make this a more filling meal, serve the chili with bread or rice. A note about the chili powder: The chipotle peppers give the soup a considerable amount of spice. Make sure that you use a chili powder that is not too spicy, if at all. A thicker chili: Some people might prefer thick chilis. If you are one of those people, use less broth (about 2 to 2 1/2 cups). LOOKING FOR MORE SOUPS + STEWS? Looking for more ways to add plant-based protein into your weekly meals? Sign up for the Half-Cup Habit for recipes and ideas on how to add a 1/2-cup serving of pulses to your meals 3 times a week! This chili is quite spicy. For a milder chili, use one chipotle pepper instead of two. If you want more smoky flavor, use smoked paprika instead of regular sweet paprika. If you prefer a thicker chili, use 2 or 2 1/2 cups of broth instead of 3. Heat the oil in a large heavy-bottomed pot over medium-high heat. Add the onions and sauté them for about 4 minutes. Add the celery, garlic and 1/2 teaspoon of salt. Sauté for another 3 minutes. Add the chili powder, cumin, paprika, chipotle peppers and the remaining 1/2 teaspoon of salt. Stir to combine the ingredients. Add the crushed tomatoes and broth, cover the pot and bring it to a boil. Remove the cover, add the beans, and reduce the heat to medium. Let the soup simmer for 10 minutes, uncovered. Turn off the heat and let the soup sit for another 10 minutes so that the beans absorb more liquid. 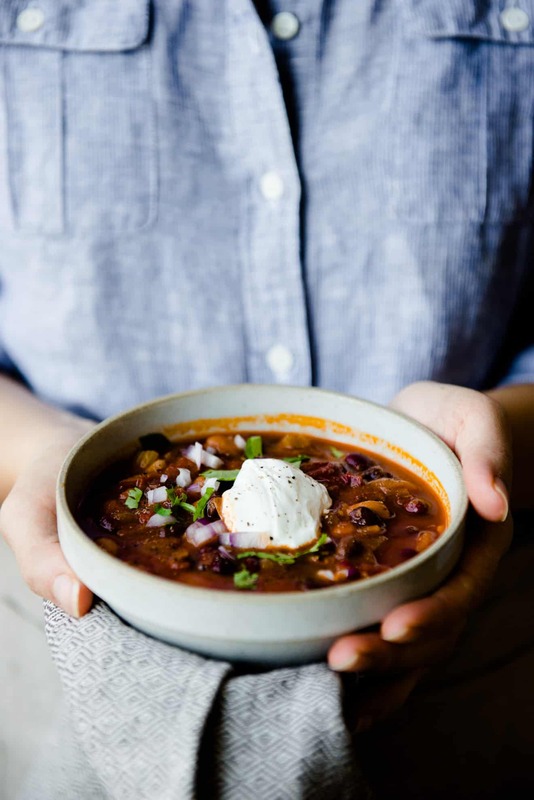 Serve the chili in bowls with a dollop of sour cream and some chopped onions and cilantro. Refrigerate any leftovers. The chili tastes even better the next day! Disclosure: This post has been sponsored by USA Pulses & Pulse Canada. Check out their website for more easy ways to use pulses in your cooking! Just made this tonight, but added some ground turkey, and used a whole 28 ounce can of crushed tomatoes since that was what I had on hand. Came out delicious! Thanks for trying the recipe, Christina!! I’m so glad you liked it! Thanks for the feedback, Sherwood! If you couldn’t find crushed tomatoes, diced tomatoes work, too. I will keep this in mind in the future though! Good to know. I’m not yet familiar enough with the crazy amount of different types of canned tomatoes to feel comfortable with substitutes. I’ll keep that in mind!